Gallia Academy junior Taylor Burnette (right) passes the ball in front of classmate Ashton Webb (11), during the Blue Angels’ sectional semifinal win on Wednesday in Centenary, Ohio. Gallia Academy junior Hunter Copley (14) spikes the ball past a pair of Lady Vikings, during the Division II sectional semifinal on Wednesday in Centenary, Ohio. CENTENARY, Ohio — A powerful way to start the postseason. 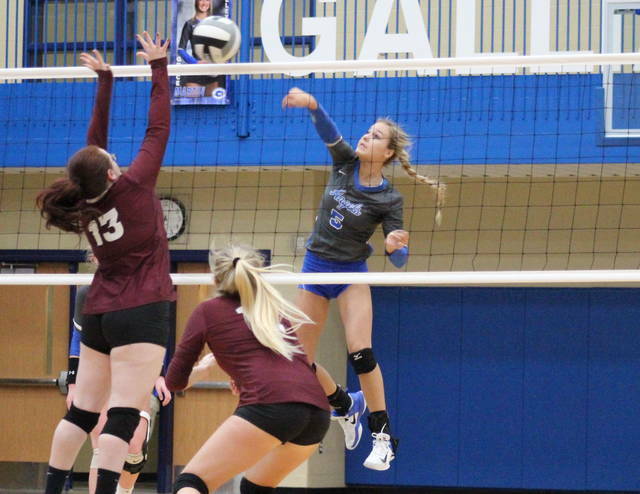 The second-seeded Gallia Academy volleyball team recorded 45 kills and a dozen aces in a straight games win over seventh-seeded Vinton County, in the Division II sectional semifinal on Wednesday in Gallia County. 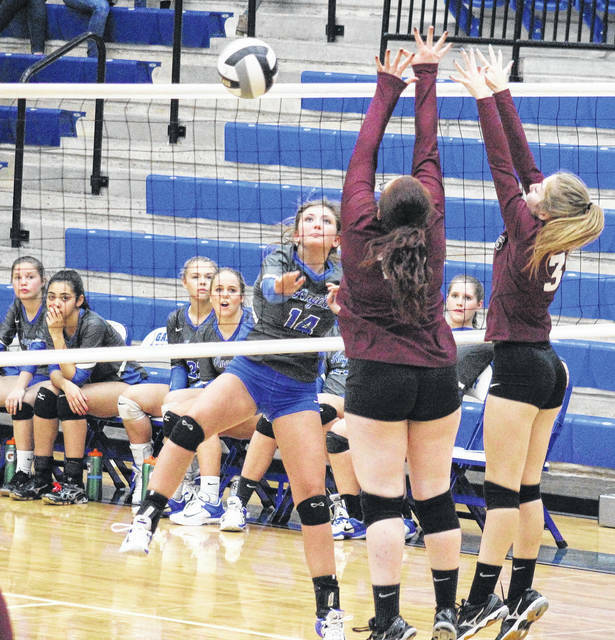 Gallia Academy (22-1) —which won its final six regular season matches —took its first lead of the night at 5-4 in the opening game. The Blue Angels led for the remainder of the first, winning by a 25-13 final after posting a side-out percentage of 64.3 in the game. The Blue Angels went ahead 2-1 in the second game and fought through just one more tie en route to a 25-12 win. GAHS had a side-out percentage of 75 in the Game 2, its best of the game, allowing VCHS to record just three service points. After a trio of early lead changes in the third game, the Blue Angels established a 5-3 advantage and never trailed again. Gallia Academy led by as many as 13 points in the finale, eventually winning by a 25-16 margin. For the match, GAHS had a 65.1-to-36.1 advantage in side-out percentage. The Blue Angels came up with 44 digs, while committing 13 hitting errors and 13 serving errors. 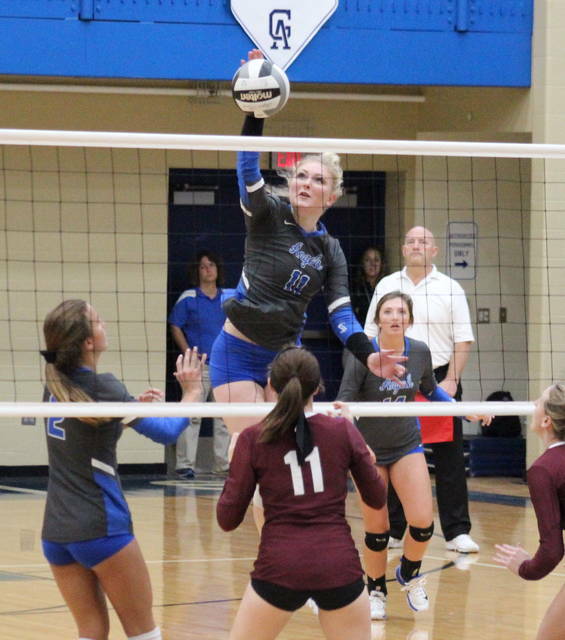 The Blue Angel service attack was led by Ashton Webb with 11 points, including five aces. Hunter Copley was next with 10 points and four aces, followed by Alex Barnes with nine points and two aces, and Taylor Burnette with seven points and one ace. Peri Martin earned four points in the win, Ryelee Sipple chipped in with three points, while Katie Carpenter finished with two service points. Webb also led the hosts at the net with a match-best 29 kills. Barnes had seven kills in the win, while Martin, Copley and Aubrey Unroe each recorded two kills, with Martin earning a team-high 37 assists and Copley leading the defense with 12 digs. Carpenter, Sipple and Maddy Petro each contributed one kill to the Blue Angel cause. Hailey Campbell led the guests with five service points, followed by Brooksanne Barnett with four. Becca Clemons and Josie Hernbree each had two points in the setback, while Sydnee Knox and Athena Marsh earned a point apiece. The Blue Angels advance to the sectional final on Saturday at 4 p.m. when third-seeded Athens visits Centenary. 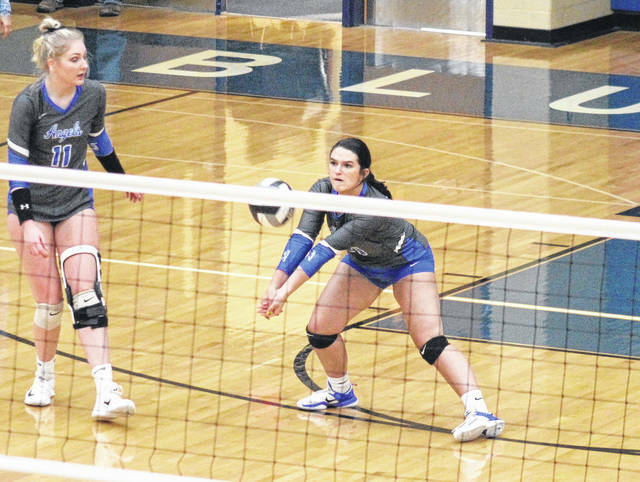 The Blue Angels will be aiming for their third straight sectional title, while the Lady Bulldogs will be gunning for their seventh sectional crown in a row.